If you have ever struggled with managing a flashlight while tending to the grill, this ingenious set of grilling tools are for you. Combining high-intensity, LED flashlights with restaurant grade 430 stainless steel into a stylish set of heavy-duty grilling tools, you will never have to grill in the dark again. This three piece tool set includes an 18-inch BBQ spatula, tongs and brush. The hinge on the tongs has a Gravity Lock, or locking mechanism that will lock the tongs shut with the one handed flick of your wrist. They are made from stainless steel that is thicker than most grill tools and the quality light means you can rely on it every time you grill at night. The LED illumination has been precisely tuned to replicate daylight - even in the darkest dusk or smoke, you will see the true colors of your food. 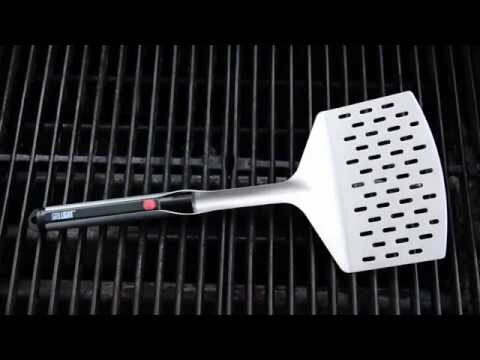 This BBQ spatula is dishwasher safe: simply remove the LED light beforehand. It also hangs from your utensil rack for easy access, and operates on two AA batteries (included). Treat the chef in your life with a better way today: the premium lighting and grilling solution! This product is warranted for thirty (30) days from the date of purchase.